Cape Town has some of the most beautiful beaches in the world. It is no surprise that South Africa was one of the first countries outside of Europe to earn blue flag status for some of her beaches. The west side of the Cape Peninsula has a very definite style of beach. This is where the more fashionable set go to see and be seen, particularly along the Atlantic Seaboard, also known as Cape Town’s ‘Riviera’, which stretches from the V&A Waterfront on the north shore of Table Mountain up as far as Hout Bay and is connected by one of the most picturesque, scenic drives along Victoria Road. Beaches here enjoy longer sunshine hours and incomparable sunsets. There is a spectacular selection of unspoilt beaches with seas that are usually 3 to 4 degrees colder than the Indian Ocean but this doesn’t seem to worry anyone soaking up the sun against the backdrop of blue skies and white sands. Clifton is the closest beach to The Glen and is an extremely popular hangout for locals and international jet setters - you’re here to be seen and to share space with the latest designer costumes and sunglasses. Clifton has four beaches called 1st, 2nd etc and 4th beach has blue flag status, not least because of the turquoise water and white sands. These beaches are Cape Town’s premier beaches, divided by granite boulders and packed with beautiful people in summer. Clifton 3rd is designated a gay beach, although not a nudist beach. Camps Bay just up the road from Clifton, is a long, sandy beach with palm trees and a fantastic promenade lined with trendy restaurants, cafes and cocktail bars. Here Cape Town’s fashionable set mingle with visitors to the city against one of the most beautiful backdrops of Lion’s Head and the 12 Apostles. The beach is very popular for sundowners and in hot weather it’s a beach paradise. From Camps Bay you can walk to Glen Beach - a small beach set in a little enclave and great for surfing. Sandy Bay, a bit of a clamber across the boulders from Llandudno or a walk from the car park, is enclosed by sand dunes and well protected from the wind. It’s Cape Town’s nudist beach and not as busy as the other beaches, possibly because of the walk. But you can escape the crowds here and don’t have to be naked in order to experience the beach. It's also a well known cruising ground for gay men. Big Bay has two rocky outcrops that jutt out into the sea, creating a bay. Blouberg has some lovely rock pools and the viewpoint from here of the bay and Table Mountain has graced many a postcard. Table View has a number of restaurants and venues for sundowners and Dolphin beach is the first of this series of beaches reached from the M14 and synonymous with kite-surfing. Milnerton is well known for its lighthouse, which sits virtually on the beach and is great for swimming as, unlike Dolphin beach, it is manned by lifeguards. There are also a number of beach cafes and restaurants here. They don’t have much beach to speak of - they’re more ocean front than beach. However, Saunders Rocks at Seapoint has a little tidal pool and Three Anchor Bay has a tiny, little beach. It’s the promenade that draws people here. This walkway is right near the sea and is a haunt of joggers, walkers, dog walkers and families. Hout Bay is a protected harbour bay great for walks and horse riding with spectacular mountain surrounds and views over the Holland Hottentots Mountains in the distance. The Chapman’s Peak side of the beach is better for sunbathing and swimming is good here as the waves are gentle. Fish and chips are the order of the day and a stroll along the pier to view the fishing boats is a treat, particularly if you can spot the odd Cape Fur seal or whale, during season. Long Beach at Kommetjie is just that, a long, sandy beach very popular with surfers. There is also a large tidal pool here great for swimming with some spectacular views. Witsands, between Kommetjie and Scarborough, is popular with surfers, windsurfers and kite-surfers alike. For locals, this is a haven as it’s further from Cape Town and thus not very well known. The beach is big and there are plenty of sand dunes, which contribute to the beauty of the natural surrounds. Misty Cliffs is wonderfully remote with some of the most awe-inspiring views of the Atlantic. Waves here can get notoriously big, so it isn’t really a swimmers paradise and even surfers take along an extra fin. It is popular with locals, divers and those wanting to escape it all. Scarborough is the last residential suburb before Cape Point. The beach is large with plenty of sand for sunbathing, popular with surfers and body boarders and has some beautiful views. Because it’s so far from Cape Town, it never gets crowded here although it can get busy in summer. When the wind blows, it’s an ideal spot for flying kites and kite-surfing. Weddings in the wild - whether on a game farm or a pristine beach - have an irresistible allure for many, but it’s just as well to be aware of some cautions (and precautions) you need to consider. Should you be planning to marry on a public beach, you will need to obtain permission. The charge for the beach venue is R25 per person and you must also have an ECO (environmental control officer) on site if you have a tent or other structures. You also need an ECO if your group is 50 or more people. You have to first request a booking, then they send you some forms to fill out, once that has been accepted, they ask for payment and thereafter confirm your booking. The Officials will inform you of the:- Administration fee and the Area Usage fee. If you are using the services of a wedding coordinator, he or she will be able to acquire the necessary permit for you. Bear in mind, that the drinking of alcohol is not permitted on public beaches. If you are travelling into the bush or remote mountains for your wedding or honeymoon, we recommend that you check in advance whether you need to take malaria tablets, as this is advisable in certain regions and that you use a qualified Guide that knows the area well. Whilst it might seem very romantic to marry on top of Table Mountain, this can be fraught with unforeseen problems. The weather is the major factor to be taken into account, as when the famous Cape South-Easter blows at gale force, the cableway does not operate. Since this is the only means of reaching the summit - besides physically climbing the mountain - you do run the risk of your wedding being put on hold for another day. Alternatively, you could be halfway through the ceremony when the cloud comes down and you have to leave the mountain! Nevertheless, if this really is your dream, the venue they offer is most suitable for small wedding parties (up to 15 people) and despite the possible drawbacks, the bonus is of course the magnificent views. 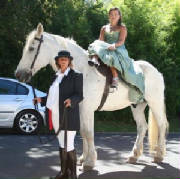 This lovely bride made her grand entrance on horseback. Her wedding was unique and 'everything' she wanted.